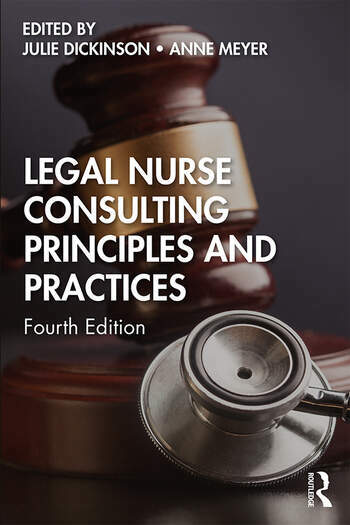 Legal Nurse Consulting Principles and Practices, 4th edition provides foundational knowledge on the specialty nursing practice of legal nurse consulting. Legal nurse consulting is defined, and essential information about the practice is discussed (history, certification, scope and standards of practice, and ethical and liability considerations). The essentials of the law and medical records are explored. Analysis of the various types of legal cases on which legal nurse consultants work is provided, as are other practice areas for legal nurse consultants. The various roles and skills of legal nurse consultants are explored, and the textbook concludes with discussion of the ways in which legal cases are adjudicated. This volume allows nurses to bridge the gap from their clinical experience to the unfamiliar territory of the legal world, with practical advice on topics including tactics for being cross-examined in the courtroom and investigative and analytical techniques for medical records. Individual chapters by subject-matter experts focus on the full range of legal, medical, and business issues that new or experienced legal nurse consultants and nurse experts will encounter in their work. A nuanced look at the realities and complexities of toxic torts, medical malpractice cases, civil rights in correctional healthcare, ERISA and HMO litigation, and other practice areas is offered. Suitable for experienced nurses studying for certification as legal nurse consultants, and for expert witnesses, practitioners seeking to expand their current legal nurse roles, and other healthcare and legal practitioners. Margaret M. Gallagher, RN MSN LNCC CLNC, Annalese H. Reese, Esq., and Paul K. Reese, Esq. Julie Dickinson MBA, BSN, RN, LNCC is a Senior Claims Analyst at Allied World Assurance Company in Farmington, CT, where she handles health care professional liability claims. Prior to her current position, she worked for nearly 10 years as a legal nurse consultant at Fontaine Alissi, P.C., a defense law firm in Hartford, CT. After graduating as Valedictorian of the Washington Hospital (PA) School of Nursing Class of 1998, Julie earned a BSN in 2000 from Waynesburg College (PA) and was inducted into the Sigma Theta Tau International Nursing Honor Society. In 2007, Julie graduated from Yale University (CT) as a member of the inaugural class of the Leadership in Healthcare MBA for Executives program. Julie was the founding president of the Connecticut Chapter of the American Association of Legal Nurse Consultants (AALNC), a past President of AALNC, and a recipient of AALNC’s Distinguished Service Award. She is board-certified in legal nurse consulting and has lectured and published on numerous legal nursing topics. Anne Meyer BSN, RN, LNCC received her Bachelor of Science degree in Nursing from Marycrest College, Davenport, Iowa. She obtained board certification in Legal Nurse Consulting (LNCC) in 2010. Ms. Meyer brings over 30 years of professional nursing experience to her work as a consultant and expert witness. She has worked as a hospital staff and charge nurse in medical-surgical, cardiac and critical care areas, Director of Nursing in both long-term care and a national home health infusion company and implemented and facilitated a vestibular diagnostic and rehabilitation program for an outpatient rehabilitation company. She is currently President of Med-Law Connection, Inc., a legal nurse consulting firm established in 2005. As an experienced legal nurse consultant, Ms. Meyer provides consulting and expert witness services to both plaintiff and defense attorneys, insurance companies and corporations covering the areas of medical malpractice and negligence, workers’ compensation, personal injury and long term care. She is a member of the AALNC, served as chair of the American Association of Legal Nurse Consultants Certification Board for two years and as an ALNCCB board member for an additional four years. Ms. Meyer has also been an item writer for the LNCC examination and authored and edited learning modules for the AALNC online Legal Nurse Consulting course. She is a nurse educator and strong advocate for the nursing profession.